The 1905 Buick Model C was powered by a two-cylinder (opposed) engine that was “guaranteed” to produce 22 horsepower. The planetary transmission offered two speeds forward and one in reverse. Wheelbase was 85 inches. The car was advertised as being able to “take any hill ‘suitable or safe’ for automobiling on high speed gear.” Price: $1200. A Detroit plumber foresaw that the future lay in gas-powered autos more than in porcelain bathtubs. At the turn of the century, a Detroit plumber and inventor who had grown rich making bathtubs, envisioned a great future for the noisy, acrid-smelling gasoline buggy which was then fighting a merciless battle for supremacy with the steam and electric horseless carriages. How that battle would end, no one at the time could foretell. But David Dunbar Buick felt that it was up to a prophet to fulfill his own prophecy; so he decided to build and market an automobile embodying technical features so new and sound that it would leave all competition behind. Whether in plumbing or in cars, David Buick cared little far the commonplace. He was responsible for launching a process that had made possible the annealing of iron and porcelain, to produce the first white bathtubs. In designing the Buick car, he soon came up with another “first” that ignored accepted ideas of automotive design. He popularized the first production water-cooled, valve-in-head engine. By 1902, Buick had completed his blueprints, built an experimental engine and obtained results that were so promising they warranted the formation of a company. Thus, the Buick Motor Company of Detroit came into being, and plans for manufacturing the car were set in motion. However, it was not easy in those days to persuade investors to sink money in any such new-fangled idea as the marketing of an automobile; and Buick, lacking capital, ran into financial trouble from the outset. Bills started piling up and it looked as though his venture might go under before it had the chance to get started. At this crucial moment, an enterprising local businessman named James H. Whiting came to the rescue by persuading his associates at the Flint Wagon Works to buy the firm from Buick’s creditors for $10,000. Whiting had to argue hard, but finally got his way and borrowed the money from a Flint, Michigan, bank. It actually was the largest single loan ever granted in the community up to that time, and on September 10, 1903, Buick was taken over by the Flint Wagon Works. It was decided to move the infant Buick company from Detroit to Flint and start production with a payroll of about 50 workers. September and December, 1903, 16 cars found their way to private owners. The sales appeal lay in the novel but simple and rugged design of the Buick and the honest workmanship that went into it. The two-cylinder, valve-in-head engine developed 21 horsepower and ran dependably, offering adequate performance for an overall weight of 1,675 pounds. A simple two-speed planetary transmission was used. The car sold for $950. In addition, the engine design produced more horses than was the case with L-head engines of comparable size. David Buick moved to Flint as president and general manager of the new company, which quickly increased its capital to $75,000. Local prejudice, however, was still deep-rooted in favor of horses. This was inevitable in a community which had become famous as “The Vehicle City” long before the advent of the automobile. Only three days after the opening of the Buick plant, a train consisting of 42 carloads of “conventional” carriages left Flint for the far west. But this didn’t discourage Buick. 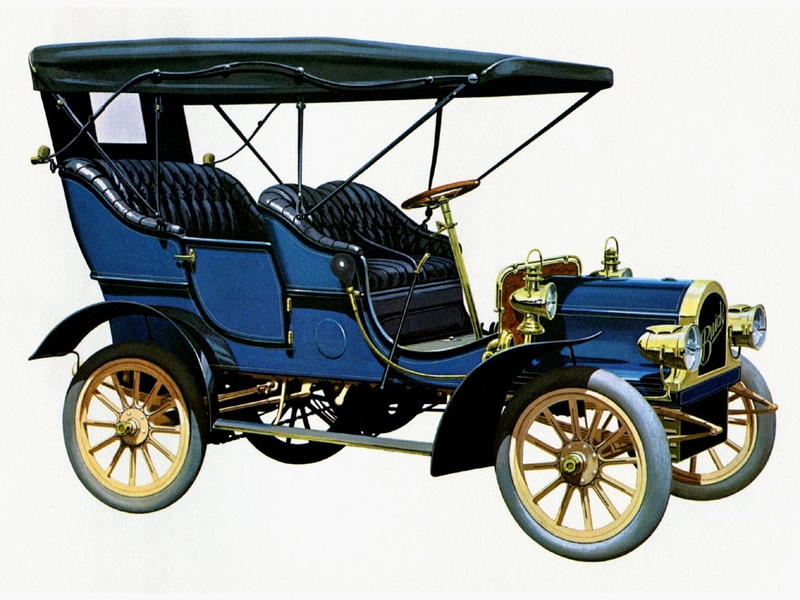 In 1904, some 37 Buick Model B cars priced at $1,200 were built and sold; but far more important things happened to the company than this production increase. Late that year, William C. Durant, the “financial wizard” of Flint, (who later gave his name to a successful automobile), stepped into the picture. Durant had made a fortune building and selling horse-drawn carriages, and as a promoter he had no equal. Like all success-promoters, he was a boundless enthusiast, who thought not in hundreds or thousands but in millions of dollars. Soon after he was appointed general manager of the Buick organization, the forceful Durant began selling stock in a big way to Flint residents. In no time, he increased the firm’s capital to $1,500,000 and started numerous local investors on the road to riches. This was despite the citizenry’s preference for horses. Track, defeating seven other starters. The driver was H. J. Koehler of New York. In 1901, 4,641 cars rolled out of the Buick plant, more than tripling the previous year’s output. During this period also, Durant--to whom nothing was too big, nothing impossible--virtually took over the company’s affairs. He hired in quick succession men of outstanding caliber in the automotive industry, such as Walter P. Chrysler and Charles W. Nash and gave their talents free rein. The 1908-10 Buick Model 10 Single Rumble had a single seat in the rear, which was popularly called the “mother-in-law” seat.. The four-cylinder (cast in pairs) engine produced 18 horsepower. It had a 92 inch wheelbase and a planetary transmission. That he picked the right men was evident, for in 1908, with the advent of the famous Model 10 Buick, production jumped to nearly 9,000 cars. Meantime, Durant completed plans for a merger with Oldsmobile and the formation of a New Jersey corporation to be known as General Motors, of which Buick was to become a division. In September 1908, General Motors was founded with a capital stock of $2,000 which increased to $12,500,000 in a few weeks and to $60,000,000 in less than a year. At this time, Durant showed more foresight by hiring Louis and Arthur Chevrolet. As an entity, the Buick factory continued to expand with breath-taking speed, and with it production figures soared ever higher from year to year, doubling and redoubling themselves as a matter of course. 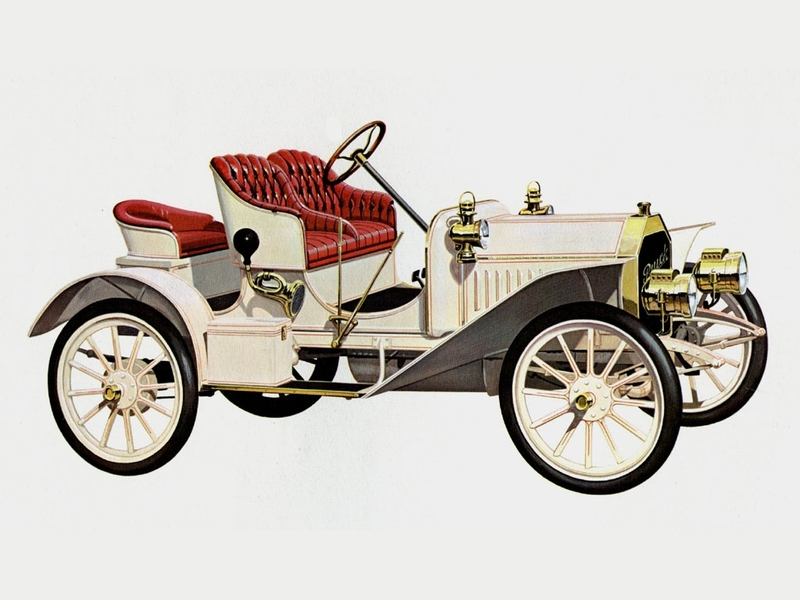 By 1910, a high of 30,525 cars was reached with nine models priced from $1,000 to $1,750. This gave Buick 16.9 per cent of the industry’s total output. That same year, Cadillac, already long established as America’s number one quality automobile, also merged with GM, to become yet another division. In 1911, however, something happened to Buick sales that caused a sharp decline to little more than 13,000 cars. That something was a bad case of financial indigestion suffered by the gangling infant, General Motors. It was caused by trying to swallow too many other enterprises. William Durant had over-reached himself in his jugglery with millions. It took until 1914, when World War I broke out, for Buick again to reach and surpass the 1910 output--with nearly 33,000 cars. Despite the War, or perhaps because of it, production continued to climb until in 1916 it soared to a new peak of 124,834 cars. During the first 14 years of its existence, Buick sold more than 322,000 cars.